G&A Institute has analyzed the index company components' sustainability reporting activities for the past six years. Our research over the last six years shows that reporting on the corporate sustainability including environmental, social and corporate governance (ESG) continues to be a consistent, reliable norm for the largest companies in US capital markets. Sustainability reporting rose dramatically from just 20% of the companies reporting in 2011 to 72% just three years later in 2013. From 2013 to 2016, the frequency of reporting has maintained with slight increases each year, now up to 82% in 2016, the latest year of our study released. Over the last few years, this consistent volume of corporate reporting underscores the importance and staying power of considering ESG issues when setting corporate strategies, managing resources and communicating to important stakeholders such as customers, employees and shareholders. 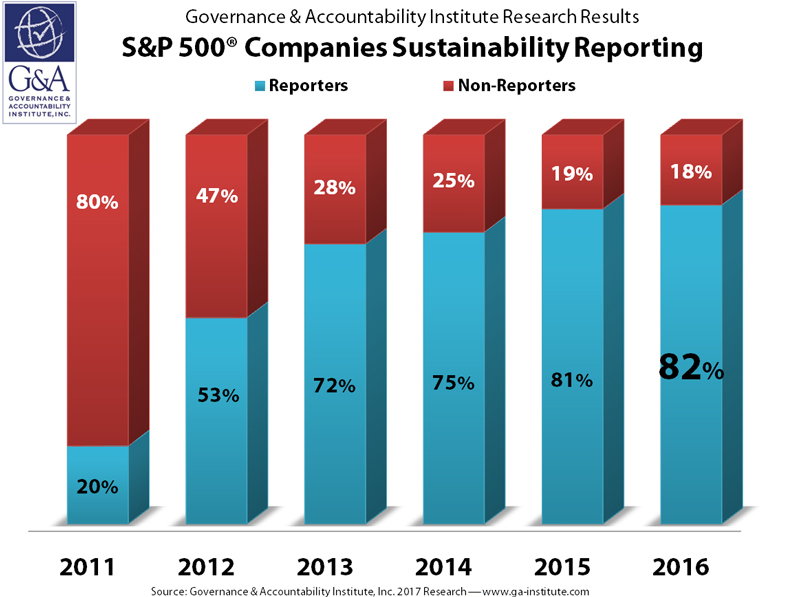 NEWSROOM: Governance & Accountability Institute, Inc.
NEW YORK, May 31, 2017 /3BL Media/ — In the sixth annual monitoring and analysis of S&P 500 Index® company sustainability reporting, just completed by theGovernance & Accountability Institute research team, the findings are that eighty-two percent (82%) of the companies included in this important investment benchmark published a sustainability or corporate responsibility report in the year 2016. The S&P Index is one of the most widely-followed barometers of the US economy, and conditions for large-cap public companies in the capital markets. in 2016, 82% signals a steady embrace by large-cap companies of sustainability reporting. As we entered the year 2017, just 18% of the S&P 500 were not publishing sustainability reports. 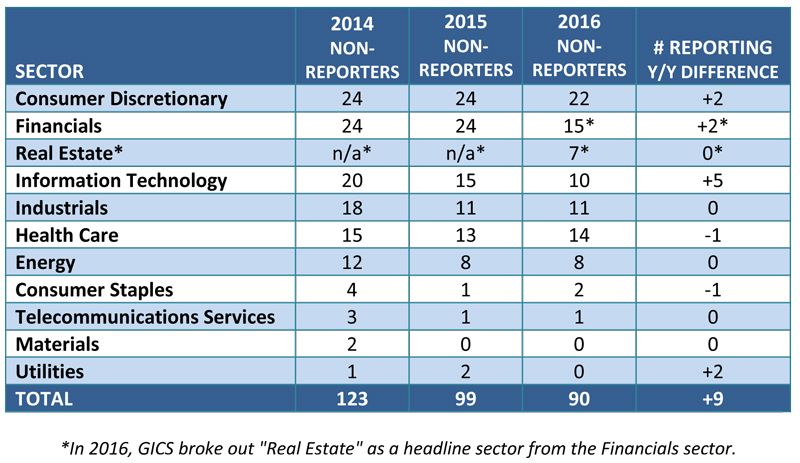 The practice of reporting by the 500 companies is holding steady with minor increases year-after-year. The graph attached represents the trends of S&P 500 sustainability reporting over the last six years. Louis Coppola, EVP & Co-Founder of G&A Institute, who designs and coordinates the annual analysis, notes: "Year after year we continue to see that corporations are reporting on their ESG performance and related issues. We also see that there are some companies that continue to ignore the growing demands of their stakeholders and shareholders. "However, the pressure is on! While searching for sustainability information on the non-reporters, more often than not, the first result on Google was an investor proxy resolution requesting for the company to start reporting on its management of ESG issues. These non-reporting companies are feeling the pressure from other stakeholders such as employees and customers as well." "As reporting standard setters and frameworks continue to evolve rapidly, leading reporters are continuously working to integrate the latest concepts into their strategy making and reporting. These leaders are seeing dramatic benefits from their efforts and are also increasingly engaging with investors to help make ESG data more strategically useful for decision-making by both company management, stakeholders and investors." Hank Boerner, Chairman & Co-Founder of the Institute, observed: "As we continue to see this steady level in US corporate sustainability and responsibility reporting, we are wondering what the thinking is in the non-reporting enterprises. These companies are now clearly laggards in this important peer group (the S&P 500), which is a very important benchmark for institutional investors. Are these companies not recognizing the significant range of benefits that accrue to their more sustainable peers? "Do they not understand the rising expectations of stakeholders seeking much more comprehensive information about their company's ESG performance? At the least, the companies seem to be firmly resistant to the demands of shareholders for more information about their ESG policies and performance." The chart attached presents the number of companies from the sectors in our annual S&P 500 study that are choosing not to report on their sustainability opportunities, risks, strategies, actions, programs and achievements implying no focus on sustainability with comparisons from 2014 through 2016. Governance & Accountability Institute's GRI Data Partner Report Analyst Research Team of talented interns contributed significantly to this research and we recognize and salute them here (see attached table). Founded in 2006, G&A Institute is a sustainability consulting firm headquartered in New York City, advising corporations in executing winning strategies that maximize return on investment at every step of their sustainability journey. The G&A consulting team helps corporate and investment community clients recognize, understand and address sustainability issues to address stakeholder and shareholder concerns. 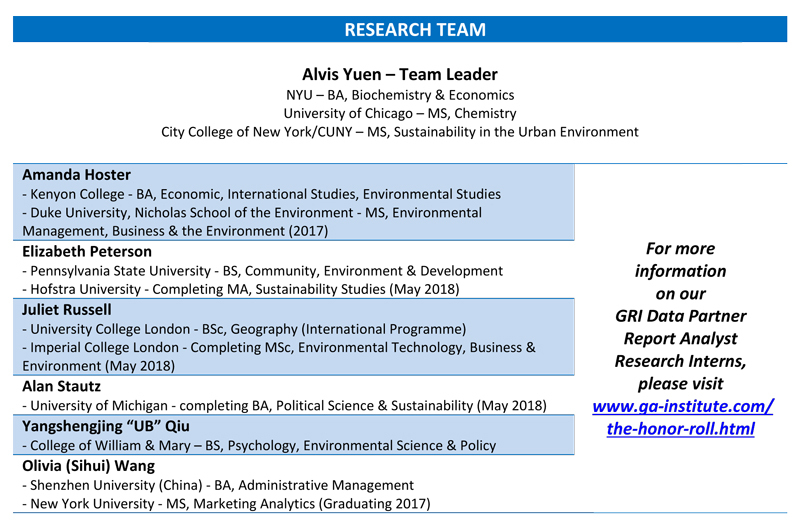 G&A Institute is the exclusive Data Partner for the Global Reporting Initiative (GRI) in the USA, UK and Republic of Ireland. A G&A team of six or more perform this pro bono work on behalf of GRI. Over the past 6-plus years, G&A has analyzed more than 5,000 sustainability reports in this role and databased more than 100 important data points for each of the thousands of reports. G&A’s sustainability-focused consulting and advisory services fall into three main buckets: Sustainability/ESG Consulting; Communications and Recognitions, and Investor Relations. The resources available within each bucket include strategy-setting; sustainability/CSR reporting assistance; materiality assessments; stakeholder engagement; ESG benchmarking; enhancing investor relations ESG programs; investor engagement; investor ESG data review; sustainability communications; manager coaching; team building; training; advice on third party awards, recognitions, and index inclusions; ESG issues monitoring and customized research. More From Governance & Accountability Institute, Inc. Videos from Governance & Accountability Institute, Inc.